This is our last newsletter of the school year. It’s been a whirlwind, literally, starting with Hurricane Irma in September. Our staff and many students responded to the community’s needs for shelter when we thought Pasco County was going to take a direct hit by a category 3 storm. We were lucky that the storm took a turn, but we know some of our families still suffered damage. Since then, we’ve had some significant accomplishments. For instance, the School Board approved the district’s first technical high school, named Wendell Krinn Technical High School. We had a tremendous response during the application period, and I’m confident this school will be a west Pasco gem. The U.S. Environmental Protection Agency (EPA) recognized Pasco County Schools with a 2017 WasteWise National Award Honorable Mention in the Local Government category for waste prevention and diversion accomplishments. Raymond B. Stewart Middle School’s football team was recognized for winning 41 consecutive football games and seven conference titles. Pasco County Schools was ranked 35th on the list of 100 Healthiest Workplaces in America. Just last month, Cambridge Assessment International Education named Pasco County Schools their District of the Year for 2017. 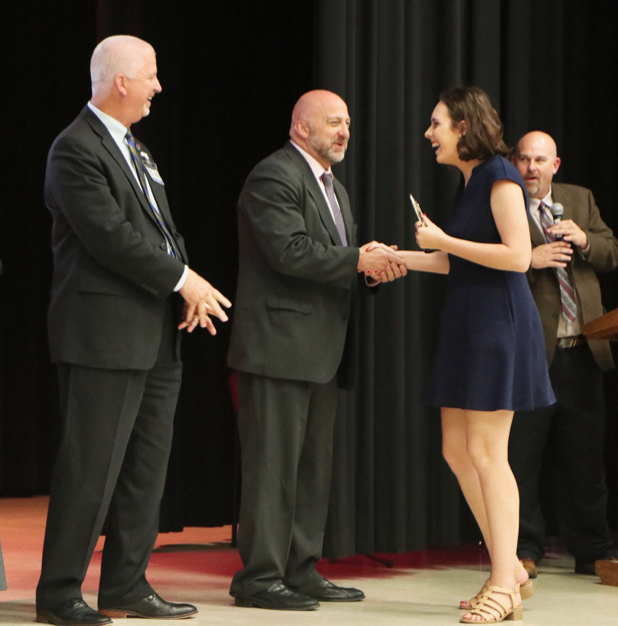 Pasco High School senior Madison Hoyle was recognized for scoring highest in the nation on the Psychology AS exam. New River Elementary School finished first in Florida and was named “Best in the State” in the 2017 Scholastic Summer Reading Challenge for recording 5,536,782 independent reading minutes from May 8, to September 7, 2017. This is a great school district with amazing students and outstanding staff! I hope everyone had a successful year, and that this last month of assessments and farewells goes smoothly. Este es nuestro último boletín del año escolar. Ha sido un torbellino, literalmente, comenzando con el huracán Irma en septiembre. Nuestro personal y muchos estudiantes respondieron a las necesidades de refugio de la comunidad cuando pensamos que el Condado de Pasco sería afectado directamente por una tormenta de categoría 3. Tuvimos suerte de que la tormenta diera un giro, pero sabemos que algunas de nuestras familias aún sufrieron daños. Desde entonces, hemos tenido algunos logros significativos. Por ejemplo, la Junta Escolar aprobó la primera escuela secundaria técnica del distrito, llamada Escuela Superior Técnica Wendell Krinn. Tuvimos una gran respuesta durante el período de solicitud, y estoy seguro de que esta escuela será una joya del oeste de Pasco. La Agencia de Protección Ambiental de U.S. (EPA) reconoció a las Escuelas del Condado de Pasco con una Mención Honorífica de Premio Nacional WasteWise bajo la categoría de gobierno local por sus logros en la prevención y diversificación de desperdicios. El equipo de fútbol de la Escuela Intermedia Raymond B. Stewart fue reconocido por ganar 41 juegos consecutivos y siete títulos. Las Escuelas del Condado de Pasco ocuparon el puesto 35 en la lista de los 100 lugares de trabajo más saludables de América. El mes pasado, Cambridge Assessment International Education nombró a las Escuelas del Condado de Pasco como su Distrito del Año para 2017. Madison Hoyle, estudiante de último año de la Escuela Superior Pasco, fue reconocida por obtener el puntaje más alto en la nación en el examen AS de Psicología. La Escuela Elemental New River terminó primera en Florida y fue nombrada "Mejor en el Estado" en el Scholastic Summer Reading Challenge 2017 por registrar 5,536,782 minutos de lectura independiente del 8 de mayo al 7 de septiembre de 2017. ¡Este es un gran distrito escolar con estudiantes increíbles y personal sobresaliente! Espero que todos hayan tenido un año exitoso y que este último mes de evaluaciones y despedidas transcurra sin problemas. May 7 – 11 is Teacher Appreciation Week, and May 8, is National Teacher Day. 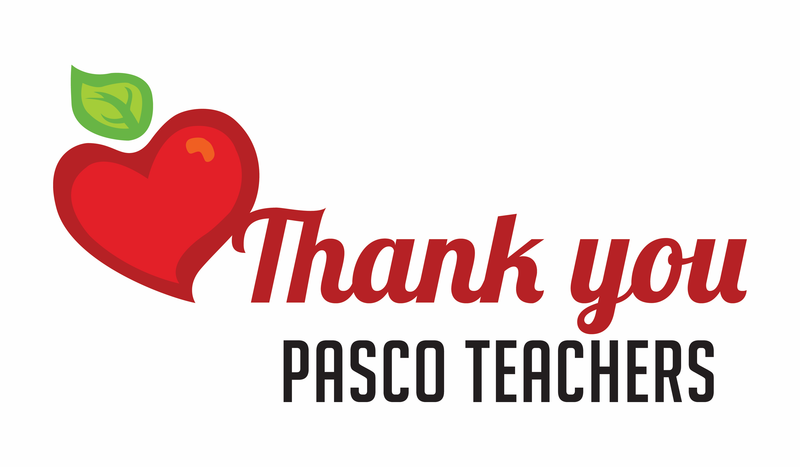 We want to make sure our educators get the recognition they deserve, so we are asking families and local businesses to share a “Thank you, Pasco teachers!” message on their social media and other platforms. Parents, please use this link to create an account or log in to myStudent to check grades and attendance, and much more. The Pasco County School Board approved my proposal to hire a director of school safety and security and up to 50 school safety guards at the school board meeting on May 1. The 2018 Florida Legislature passed, and the governor signed into law, SB 7026, requiring all school districts to provide security at all schools beginning in the 2018-2019 school year. The Legislature also provided funding in the bill. All middle and high schools will continue to be staffed with an SRO through the Pasco Sheriff’s Office and municipal police departments. All elementary schools will be staffed with school safety guards. The district is hosting two recruitment and interview events for the school safety guard positions on May 10 and May 21, from 4 p.m. to 7 p.m. in building 2 of the district office complex. For more information, click here. The Pasco County Council PTA/PTSA and the district have scheduled two town hall meetings to provide an update and get community input on school safety. The first meeting was held on May 2. The next will be held at Wiregrass Ranch High School in the cafeteria on Monday, May 7, from 6 p.m. to 8 p.m.
We will have a presentation about current safety efforts, what the new law requires, and our plans for complying with the law. A question and answer period will follow the presentation. We are inviting our law enforcement and community mental health partners to join us. Legislators and other elected officials also will be encouraged to attend. Click here for more information. This year, 4th quarter report cards will be available online in the myStudent portal after final state assessment data is received and loaded into the student information system. What this means for families is that paper report cards will not be mailed home; report cards only will be accessed in the parent and student portals of myStudent. We expect to receive the state assessment results by the end of June. Report cards will be available shortly thereafter. We will notify all families by phone message when report cards become available for families to view. Third grade ELA FSA results will be reported prior to the end of the school year so that schools and families can make decisions about promotion and retention. In order to access the 4th quarter report cards, it is essential for parents to have a myStudent account already set up. To create a parent account, go to the district website, www.pascoschools.org, and click on the Parents link at the top. Then click on the Parent Access to myStudent link below the video. Each school has identified staff members to help parents who need assistance setting up an account. If you have questions about creating your account, please contact your child's school. Pasco County Schools kindergarten pre-registration for children who turn 5 years old on or before September 1, 2018, is Monday, May 7, at all Pasco County elementary schools. Those interested should contact the school in their area for details about orientation activities and times. Expectant mothers, infants, toddlers, and children through age 5 that meet income eligibility requirements may apply for Head Start or Early Head Start. Completing an application does not guarantee a child's eligibility for services. VPK will offer summer school programs at Fox Hollow and West Zephyrhills elementary schools. The programs will be held from June 6 through July 26 (no school on 6/15, 6/22, 6/29, 7/4, 7/13, 7/20, and 7/27). The hours of service for children are 7:30 a.m. to 5 p.m. If you have not used your VPK voucher, please contact the Early Learning Coalition of Pasco Hernando. For a flyer with more information, click here. For VPK contact information, click here. The Pasco County School Board agreed to a plan to have all students take their final exams at the same time, beginning with the 2019 graduating class. Classes will conclude later in the spring and everyone will get out of school on the same day. This plan will move graduations to early June, rather than late May. Due to state changes with testing rules a year ago, the time frame in which schools can conduct their spring assessments has been reduced to two weeks. Moving the final exams later will maximize instructional time and maintain consistent grade processing for all students. Click here for the proposal details. Summer dual enrollment textbook pick-up begins next week. Students should bring their summer term schedule to textbook pick-up to verify the courses in which they are enrolled before books will be distributed. If a student receives a voucher for any or all of their textbooks it must be used within 30 days of the published PHSC “drop date”. All textbooks that have been checked out for previous terms must be returned prior to new books being issued. Click here for a list of locations and dates. Registration for the CREW summer camp at the Energy and Marine Center is now open. Students entering 2nd through 10th grade are eligible to participate in our camps during June 4 to 7, 11 to 14 and 18 to 21. Kayaking, fishing, Dames Caves, Crossbar Ranch, Crystal Spring Preserve, and Shipwreck Island Survival Week (June 11 to 14) are just a few of the action packed weekly adventures. Click here for more information and to register. Wow your kids this summer with a summer camp that emphasizes exploration, interaction, and growth. 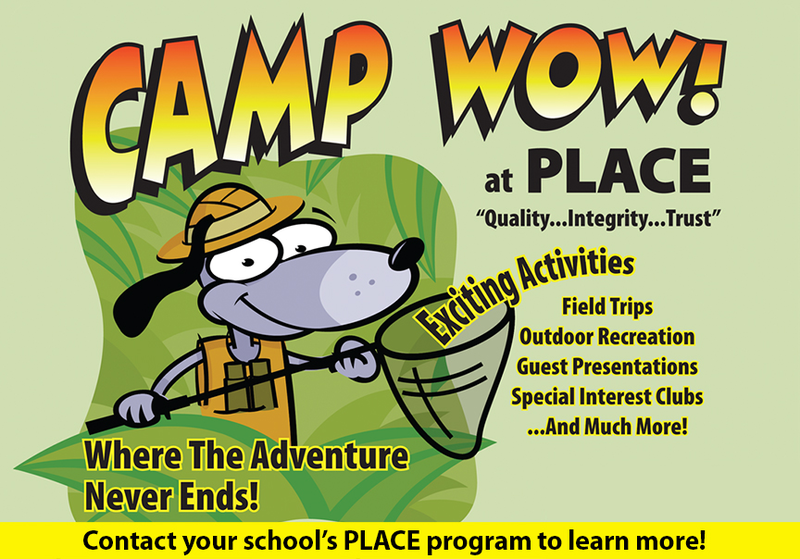 Registration is now open for PLACE's Camp Wow, which runs from 6:30 a.m. to 6 p.m., June 4, through August 8. For pricing and more details, click here. La Junta Escolar del Condado de Pasco aprobó mi propuesta de contratar a un director de seguridad escolar y hasta 50 guardias de seguridad escolar en su reunión del 1 de mayo. La Legislatura de Florida 2018 pasó, y el gobernador promulgó la ley, SB 7026, requiriendo de todos los distritos escolares proporcionar seguridad en todas las escuelas a partir del año escolar 2018-2019. La Legislatura también proporcionó fondos a la par de la ley. Todas las escuelas intermedias y secundarias continuarán teniendo un Oficial Recurso de Seguridad a través de la Oficina del Alguacil de Pasco y los departamentos de policía municipal. Todas las escuelas primarias contarán con guardias de seguridad escolar. El distrito está organizando dos eventos de entrevistas y reclutamiento para los puestos de guardia de seguridad de la escuela el 10 de mayo y el 21 de mayo a partir de las 4 p.m. a 7 p.m., en el edificio 2 del complejo de oficinas del distrito. Para más información, haga clic aquí. El Concejo PTA/PTSA del Condado de Pasco y el distrito has programado dos reuniones comunitarias para ofrecer información al día y recoger las opiniones de la comunidad sobre la seguridad en las escuelas. La primera reunión será el 2 de mayo. La próxima será en la Escuela Superior Wiregrass Ranch, en la cafetería, el 7 de mayo de 6 p.m. a las 8 p.m.
Tendremos una presentación sobre los esfuerzos relacionados a la seguridad, lo que la nueva ley requiere y los planes para cumplir con la ley. Después de la presentación habrá un periodo de preguntas y respuestas. Invitamos al departamento de policía y profesionales de la salud mental para que estén presentes. También hemos motivado a los legisladores y oficiales electos a asistir. Presione aquí para más información. Este año, los reportes del cuarto trimestre estarán disponibles en línea a través del portal myStudent una vez que los datos finales de la evaluación del estado se reciban y sean entrados al sistema de información del estudiante. Lo que esto significa para las familias es que los reportes de calificaciones en papel no se enviarán a casa; solo tendrán acceso a los reportes de calificaciones a través de los portales para padres y estudiantes de myStudent. Esperamos recibir los resultados de la evaluación estatal para fines de junio. Los reportes de calificaciones estarán disponibles poco después. Enviaremos un mensaje telefónico a todas las familias cuando los reportes de calificaciones estén disponibles para que las familias los puedan ver. Para poder acceder a los reportes de calificaciones del cuarto trimestre, es esencial que los padres ya hayan creado una cuenta en el sistema myStudent. Para crear su cuenta para padres, vaya al sitio web del distrito, www.pascoschools.org, y haga clic en el enlace de Padres que aparece en la parte superior. 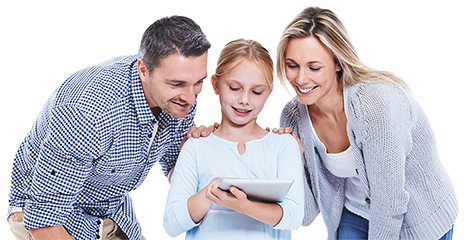 Luego, haga clic en el enlace Parent Access to myStudent debajo del video. Cada escuela ha seleccionado a miembros del personal para asistir a los padres que necesiten ayuda para abrir una cuenta. Comuníquese con la escuela de su hijo si tiene preguntas sobre cómo crear su cuenta. La pre-inscripción al Kindergarten de las Escuelas del Condado de Pasco para niños que cumplen 5 años el 1 de septiembre de 2018, o antes, es el lunes 7 de mayo en todas las escuelas primarias del Condado de Pasco. Los interesados deben ponerse en contacto con la escuela en su área para obtener detalles sobre las actividades y horarios de orientación. Las mujeres embarazadas, los bebés, los niños pequeños y los niños hasta los 5 años que cumplan con los requisitos de ingresos pueden solicitar Head Start o Early Head Start. Completar una solicitud no garantiza la elegibilidad de un niño para los servicios. Haga clic aquí para obtener más información y requisitos. VPK ofrecerá programas de escuela de verano en las escuelas elementales Fox Hollow y West Zephyrhills. Los programas se llevarán a cabo desde el 6 de junio hasta el 26 de julio (no hay clases el 6/15, 6/22, 6/29, 7/4, 7/13, 7/20 y 7/27). Las horas de servicio para niños son de 7:30 a.m. a 5 p.m. Si no ha utilizado su cupón VPK, comuníquese con Early Coalition of Pasco Hernando. Para un folleto con más información, haga clic aquí. Para información de contacto de VPK, haga clic aquí. La Junta Escolar del Condado de Pasco acordó un plan para que todos los estudiantes presenten sus exámenes finales al mismo tiempo, comenzando con la clase graduanda 2019. Las clases continuarán hasta el fin de la primavera y todos terminarán el año escolar el mismo día. Este plan cambiará las fechas de las graduaciones para principios de junio, en lugar de a fines de mayo. Debido a los cambios hechos por el estado el año pasado en relación a las reglas que rigen las evaluaciones, el periodo en el que las escuelas pueden realizar sus evaluaciones de primavera se ha reducido a dos semanas. Mover los exámenes finales más tarde maximizará el tiempo de instrucción y mantendrá un procesamiento de calificaciones consistente para todos los estudiantes. Haga clic aquí para ver los detalles de la propuesta. Los estudiantes deben devolver sus libros de texto de primavera antes de que puedan tomar nuevos libros. Los estudiantes deben traer su horario de verano a la recogida de libros de texto para verificar los cursos en los que están inscritos antes de que se distribuyan los libros. Una vez el estudiante reciba un comprobante de uno o todos sus libros de texto, éste debe ser utilizado dentro de los 30 días posteriores a la fecha de publicación de PHSC. Los estudiantes de cuarto año deben devolver sus libros y/o pagar las tarifas para estar listos para la revisión de salida. Los libros de texto deben ser devueltos a los lugares designados. Haga clic aquí para obtener una lista de lugares y fechas. La registración para el campamento de verano del Centro CREW de Energía y Marina ya está abierta. Los estudiantes entrando del 2do al 10mo grado pueden participar en nuestros campamentos del 4 al 7, 11 al 14 y 18 al 21 de junio. Kayak, pesca, Cuevas Dames, Rancho Crossbar, Crystal Spring Preserve y nuevo este año, semana de sobrevivencia en Shipwreck Island (11 al 14 de junio) son solo algunas de nuestras aventuras semanales llenas de acción. Haga clic aquí para obtener más información y para registrarse. Sorprenda a sus hijos este verano con un campamento de verano que enfatiza la exploración, la interacción y el crecimiento. La inscripción ya está abierta para PLACE's Camp Wow, que se extiende desde las 6:30 a.m. hasta las 6 p.m., del 4 de junio al 8 de agosto. Para conocer los precios y obtener más información, haga clic aquí. For the 2018-19 school year, you will be able to apply for free and reduced meals on-line using www.pascoschoolmeals.com. Applications for the upcoming school year will be available starting July 16, 2018. For more information, click here. Podrá solicitar comidas gratis o reducidas para el año escolar 2018-19 en línea visitando www.pascoschoolmeals.com. Las solicitudes para el próximo año escolar estarán disponibles a partir del 16 de julio de 2018. Para más información, haga clic aquí. After months of planning and hard work, Pasco County government is delighted to announce the launch of their new website. The goal was to craft a more accessible format to better collaborate with partners, customers, and visitors to create a clean, elegant, professional, and easily accessible engagement tool. The site has been redesigned with end users in mind. Expanded search capabilities, mobile device compatibility, streamlined menu options, simpler navigation, and direct access to the information you need are just a few of the enhanced features. Click here to check it out. Help shape Pasco County’s future! The annual Pasco County citizen survey is officially opened and will be available through May 18. The citizen survey, first launched in 2009, is conducted every year to collect feedback on a variety of topics related to the future of Pasco County. Pasco County receives thousands of responses to the online citizen survey each year, which is intended to help the Pasco Board of County Commissioners with planning discussions and decision-making. To complete the survey click here. Results from previous citizen surveys are available here. Traffic on Pasco County roads is expected to double in the next 30 years. Here’s your chance to let the Pasco County Metropolitan Planning Organization (MPO) know what you think about transportation issues as we plan for the future. The It’s TIME Pasco survey is open through June 1, and asks about safety, trails, buses, congestion, traffic and any other transportation issues you’d like to address. The MPO is the lead transportation planning agency for Pasco County. This survey is the first of several that will help update Pasco MPO’s transportation plan, It’s TIME Pasco, set to be adopted in December 2019. Click here to complete the survey. Después de meses de planificación y arduo trabajo, el gobierno del Condado de Pasco se complace en anunciar el lanzamiento de su nuevo sitio web. El objetivo era crear un formato más accesible para colaborar mejor con socios, clientes y visitantes a fin de crear una herramienta de participación limpia, elegante, profesional y de fácil acceso. El sitio ha sido rediseñado con los usuarios en mente. Capacidades de búsqueda ampliadas, compatibilidad con dispositivos móviles, opciones de menú simplificadas, navegación más simple y acceso directo a la información que necesita son solo algunas de las características mejoradas. Haga clic aquí para echarle un vistazo. ¡Ayude a formar el futuro del Condado de Pasco! La encuesta anual de ciudadanos del Condado de Pasco se inaugura oficialmente y estará disponible hasta el 18 de mayo. La encuesta de ciudadanos, lanzada por primera vez en 2009, se realiza todos los años para recopilar comentarios sobre una variedad de temas relacionados con el futuro del Condado de Pasco. El Condado de Pasco recibe miles de respuestas a la encuesta en línea para ciudadanos cada año, que tiene como objetivo ayudar a la Junta de Comisionados del Condado de Pasco a planificar debates y tomar decisiones. Para completar la encuesta, haga clic aquí. Los resultados de las encuestas de ciudadanos anteriores están disponibles aquí. Se espera que el tráfico en las carreteras del Condado de Pasco se duplique en los próximos 30 años. Esta es su oportunidad para que la Organización de Planificación Metropolitana (MPO) del Condado de Pasco sepa lo que usted piensa sobre los problemas de transporte mientras planificamos para el futuro. La encuesta It's TIME Pasco está abierta hasta el 1 de junio y hace preguntas sobre la seguridad, las rutas, los autobuses, la congestión, el tráfico y cualquier otro problema de transporte que desee abordar. La MPO es la agencia principal de planificación de transporte para el Condado de Pasco. Esta encuesta es la primera de varias que ayudarán a actualizar el plan de transporte de Pasco MPO, It's TIME Pasco, que se adoptará en diciembre de 2019. Haga clic aquí para completar la encuesta. Parents, please use this link to check grades and attendance, access the school choice application, create a myStudent account, and more. Receive Pasco Schools announcements via SMS text messaging to your mobile phone. Make sure the school has your mobile phone number on file. You will receive a confirmation message from our messaging system. At any time, you can unsubscribe by texting the word STOP to 67587. Remember to create a contact in your phone with the name of the school and the phone number 67587. Reciba avisos de las Escuelas de Pasco vía mensajes de texto SMS a su teléfono celular. Asegúrese de que la escuela tenga su número celular. Usted recibirá una confirmación a través de nuestro sistema de mensajes. Puede cancelar la suscripción en cualquier momento enviando un texto con la palabra STOP al 67587. Recuerde crear un contacto en su celular con el nombre de la escuela y el número de teléfono 67587. Between preparing healthy meals, adhering to strict nutrition standards, navigating student food allergies, and offering service with a smile, school nutrition professionals are true heroes. On Friday, May 4, we will kick off School Nutrition Employee Week (May 7 to 11) with a bang, as we celebrate the 6th Annual School Lunch Hero Day! This day is to recognize and celebrate the hardworking professionals in your cafeteria, who fuel our emerging future leaders with the healthy meals that make a difference in their success. Marjorie's Hope is all about giving hope to children through their back to school backpack program and clothes donation program. Marjorie's Hope is having their 2nd annual Quarter Auction on Saturday, May 5. The auction will be held at Seven Springs Golf & Country Club at 7 p.m. This is the last fundraising event before they fill backpacks in August. Their goal this year is to fill 4,000 backpacks. Donations for raffle baskets and business sponsorships will be accepted. Click here for information on the auction and here to learn more about Marjorie's Hope. May 7 and 8, 10:30 a.m.
Entre la preparación de comidas saludables, la adhesión a estrictas normas de nutrición, la exploración de las alergias a los alimentos de los estudiantes y la prestación de servicios con una sonrisa, los profesionales de la nutrición escolar son verdaderos héroes. El viernes, 4 de mayo, comenzaremos la Semana de Empleados de Nutrición Escolar (del 7 al 11 de mayo) con gran éxito, mientras celebramos el 6to. Día Anual del Héroe del Almuerzo Escolar. Este día es para reconocer y celebrar a los profesionales trabajadores en su cafetería, quienes alimentan a nuestros futuros líderes emergentes con comidas saludables que marcan la diferencia en su éxito. Marjorie's Hope trata de dar esperanza a los niños a través de su programa de mochila de regreso a la escuela y el programa de donación de ropa. Marjorie's Hope está celebrando su segunda subasta trimestral anual el sábado 5 de mayo. La subasta se llevará a cabo en Seven Springs Golf & Country Club a las 7 p.m. Este es el último evento de recaudación de fondos antes de que llenen mochilas en agosto. Su objetivo este año es llenar 4,000 mochilas. Se aceptarán donaciones para canastas de rifas y patrocinios comerciales. Presione aquí para información sobre la subasta y aquí para saber más sobre Marjorie´s Hope. Mayo 7 y 8, 10:30 a.m.
Cambridge Assessment International Education honored Madison Hoyle for scoring highest in the nation on the Psychology AS exam. In addition to Madison, 30 Pasco High School students were recognized as AS scholars for their achievement on Cambridge examinations. Congratulations to all the Cambridge Scholar Award Winners! Cambridge Assessment International Education honró a Madison Hoyle por obtener el puntaje más alto de la nación en el examen AS de Psicología. Además de Madison, 30 estudiantes de la Escuela Superior Pasco fueron reconocidos como estudiantes sobresalientes de AS por su desempeño en los exámenes de Cambridge. ¡Felicidades a todos los ganadores de los premios Cambridge Scholar! Don’t forget to take advantage of Pasco County Schools' summer meal program when school ends! The program runs from June 4 until August 3. Meals will be served free of charge at 48 school locations and 51 additional locations around the county to everyone under the age of 18. Click here to find the location nearest you. The Pasco Literacy team has developed a list of literacy activities for parents and students to engage in over the summer. Literacy experts and educators agree that children of all ages need to be read to, read by themselves, and talk about the books they have read during the summer. Students’ summer reading and book discussions will help maintain reading skills, improve reading fluency, and provide the opportunity to learn new vocabulary and concepts. Most importantly, when parents and children enjoy summer reading together, children develop a love of books and reading that lasts a lifetime. We hope you enjoy these activities! Click here for summer literacy activities and resources. The Pasco County Public Transportation Department (PCPT) has a great ‘Summer Haul Pass’ deal for Pasco County students: a one-time fee to ride PCPT’s fixed route bus system all summer! The special student rate of $20 will be good for all bus rides from June 1 through August 31. For more information and where to purchase passes, click here. The 2018 hurricane season is predicted to have an above average number of hurricanes. Hurricane season begins on June 1 and runs through November 30. As seen last year, hurricanes can devastate a home, neighborhood, or an entire community if not properly prepared. Please take time to prepare yourself and your family for this potentially active upcoming hurricane season. Below are community resources to help plan if you need to take action during a hurricane. ¡No olvide aprovechar el programa de comidas de verano de la Escuela del Condado de Pasco cuando termine la escuela! El programa estará abierto desde el 4 de junio hasta el 3 de agosto. Las comidas se servirán libres de costo en 48 ubicaciones escolares y 51 ubicaciones adicionales en todo el condado para todos los menores de 18 años. Haga clic aquí para buscar la ubicación más cercana a usted. El equipo de alfabetización de Pasco ha desarrollado una lista de actividades de alfabetización para que padres y alumnos participen durante el verano. Los expertos en alfabetización y los educadores están de acuerdo en que los niños de todas las edades deben leer, leer solos y hablar sobre los libros que han leído durante el verano. Las lecturas de libros y lecturas de verano de los estudiantes ayudarán a mantener las habilidades de lectura, mejorar la fluidez de la lectura y brindar la oportunidad de aprender vocabulario y conceptos nuevos. Lo más importante es que cuando los padres y los niños disfrutan de la lectura de verano juntos, los niños desarrollan un amor por los libros y la lectura que dura toda la vida. ¡Esperamos que disfrute de estas actividades! Haga clic aquí para ver las actividades y los recursos de alfabetización de verano. El Departamento de Transporte Público del Condado de Pasco (PCPT) tiene un gran trato de 'Summer Haul Pass' para los estudiantes del Condado de Pasco: ¡una tarifa única para usar el sistema de autobuses de ruta fija del PCPT durante todo el verano! La tarifa especial para estudiantes de $20 será válida para todos los viajes en autobús desde el 1 de junio hasta el 31 de agosto. Para obtener más información y dónde comprar pases, haga clic aquí. Se predice que la temporada de huracanes de 2018 tendrá una cantidad de huracanes superior a la promedio. La temporada de huracanes comienza el 1 de junio y finaliza el 30 de noviembre. Como pudimos ver el año pasado, los huracanes pueden devastar un hogar, un vecindario o una comunidad entera si no se preparan adecuadamente. Por favor tómense el tiempo para prepararse y preparar a su familia para esta próxima temporada de huracanes la cual será una potencialmente activa. A continuación se encuentran los recursos comunitarios para ayudar a planificar si necesita tomar medidas durante un huracán. 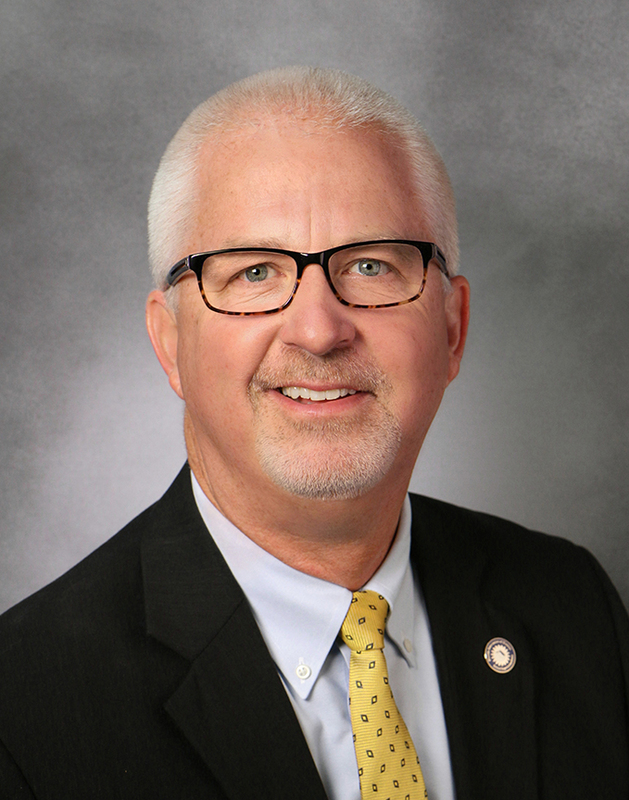 Pasco Parent Press is Superintendent Browning’s monthly newsletter to parents and is published by the Communications and Government Relations Department.